Alton Handbells and the Heath Belles, 7.30 pm, Saturday 8 December, Alton Village Hall. Tickets are available from 1st November. Adults £12, children £5, including pie and peas supper (with dessert). Please go to the ‘Contact’ page to order tickets. Our Grand Christmas Concert in aid of the Donna Louise Trust this year combines the talents of a section of the Heath Chorus (The Heath Belles) and the Alton Handbell Ringers. Chris Mellor will host the show and we look forward to welcoming a speaker to update us on the Donna Louise Trust. 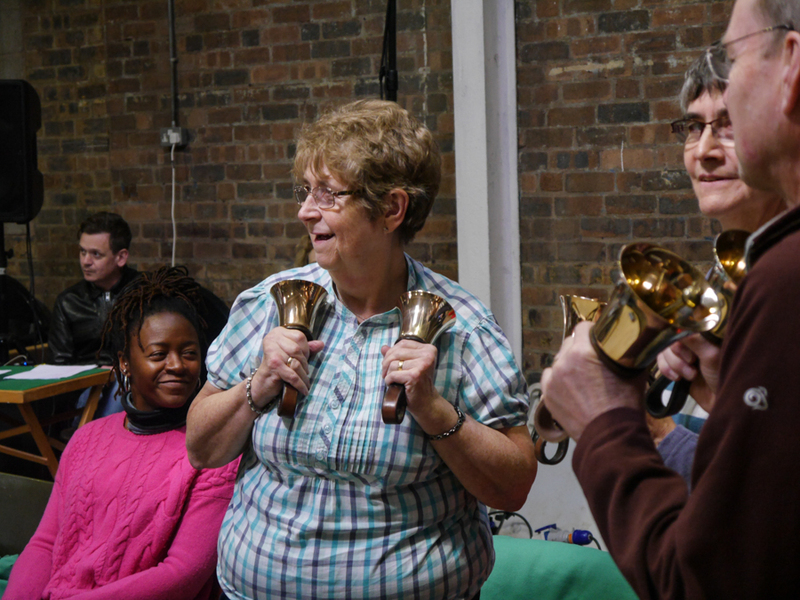 Read more about Alton Handbells and the Heath Belles, 7.30 pm, Saturday 8 December, Alton Village Hall. Friday night saw the AHR perform with a team from the Royal Exchange Theatre, Manchester at B-Arts in Stoke-on-Trent. Community theatre, in the round about community life, at its best despite basic facilities; a stark warehouse from the outside - blink and you would miss it in passing. The welcome was warm and friendly, a lingering smell of baking bread and cakes, plus tea/coffee and even a bar. This was part of “The Mysteries” cycle of 6 short plays performed in the actual town or city written about. Stoke-on-Trent was fifth in the cycle. The others were Eskdale, Staindrop, Whitby, Boston and Manchester, the last being the finale on 4 and 11 November at The Royal Exchange. The caption on the programme “when a place gets big enough to tell itself a story...”.